There’s truly nothing like homemade vinegars. We always have a batch or two fermenting on top of the fridge, at the ready to be whisked into salad dressings or a pot of beans. 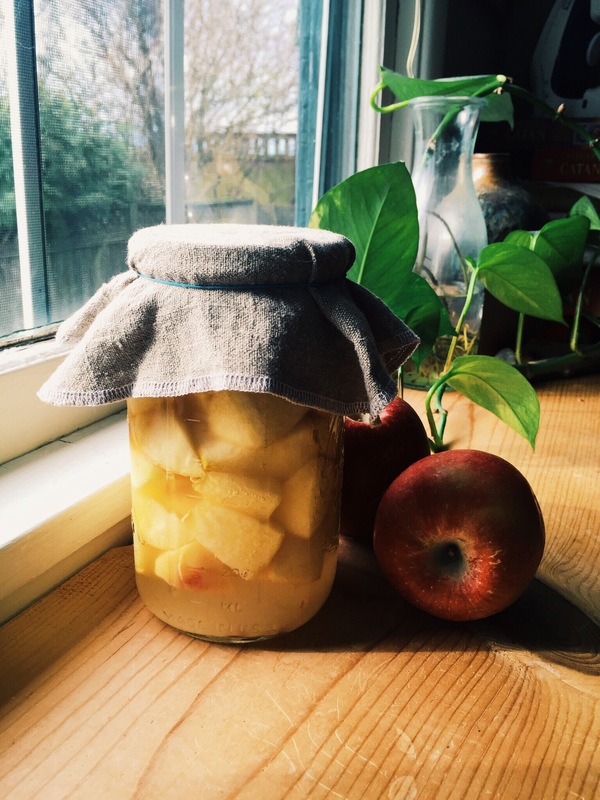 Apple cider vinegar is a wonderful introduction to the world of fermentation and it only takes a few minutes of hands on work. Once it’s done and you’ve tasted the fruit of your labors, you too will always have a batch in production. 1. Place apple pieces in a very clean quart sized jar. In a separate container, dissolve sugar in water. Pour over apples to cover, leaving about an inch of room at the top. Cover with cheesecloth and a rubberband. 2. Place the jar in a warm place where it won’t be disturbed and let it sit for two weeks. 3. After 2 weeks, strain the liquid off the apples and place in a fresh jar. Discard the apple bits. Cover the jar of liquid with cheesecloth again and let it sit for another 4 weeks. It will begin to develop a funky blob or white scum – this is the vinegar “mother” which is converting the liquid into vinegar! If any blue, grey, or green scum develops, this is bad news and you’ll need to toss the whole batch. 4. After 4 weeks, begin tasting your vinegar. When it has a pleasant acidity, it’s ready to use! This stuffing recipe was a hit in our house this Thanksgiving and is sure to make an appearance on the holiday table again this year and for years to come. I hope you are having a lovely holiday weekend. Our home has been filled with friends and family- a welcome reminder of the bounty we are surrounded by. I am so grateful for Jubilee Farm and the amazing produce that graces our table every week. It’s truly an honor to write recipes that feature their harvests. The holidays are officially upon us. Feast and enjoy! 1. Preheat oven to 400°. Combine squash, mushrooms, apples, and shallots in a large mixing bowl and toss with 2 tablespoons olive oil and salt. Roast until squash is easily pierced with a fork, about 20-30 minutes. When finished cooking, remove veggies and turn oven down to 350°. 2. In a large Dutch oven, heat oil then sauté onions and celery over medium-high heat for 5 minutes. Add bread and continue cooking, stirring often for another 5-8 minutes. 3. Add roasted vegetables, stock, and herbs to the pot. Stir mixture over medium heat until the bread has absorbed most of the stock. 4. Transfer to oven with lid and bake 20 minutes, remove lid and cook for another 10 minutes. Transfer to a serving dish or place it right on the table! As promised, here’s another simple recipe for a cozy night in… Or maybe a special breakfast if you’d like to treat yourself! Be sure to drizzle the pan juices over the apples after you place them in their bowls for serving. 1. Preheat oven to 400°. Core apples and use a sharp knife to score the skin of the apple- four scores should do the trick. 2. Place apples in a baking dish and place one tablespoon of butter inside the core cavity of each apple. Sprinkle with cinnamon. Bake for 45 minutes. 3. While the apples are baking, combine maple syrup and heavy cream. Whip until the cream forms soft peaks. Refrigerate until ready to use. 4. 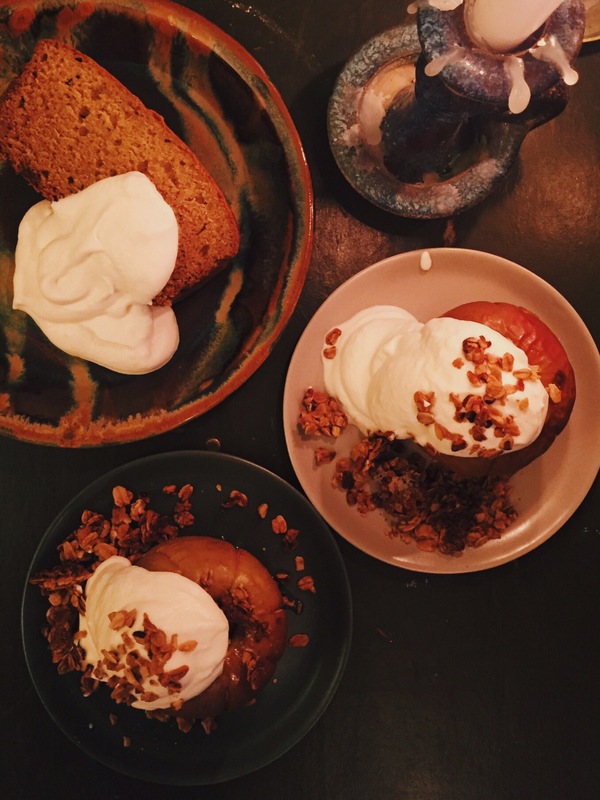 When the apples are done, place in individual bowls and top each apple with a sprinkling of granola and a generous dollop of whipped cream. Shrubs are a beverage that go back to colonial times as a way of saving the season to enjoy throughout the year. Shrub refers to a sweet and sour syrup that can be enjoyed as a sipping vinegar or diluted with club soda. Historically, these beverages were related to the medicinal cordials of medieval England. Today, they are used as aperitifs or ingredients in cocktails. They involve fruit and herbs or spices that steep in vinegar and are later sweetened with honey or sugar. Throughout the year, I make several batches to enjoy diluted as a carbonated treat. Here are a couple of recipes to try out. Feel free to play with the amount of sugar you add or the type of fruit. In summer I make batches with different types of berries, but fall and winter are great with apples, pears, quince, or persimmons. I recommend using Bragg’s apple cider vinegar as it is unfiltered and not too acidic to be enjoyable. There are also some sources that claim apple cider vinegar may aid digestion, adding to its allure as an aperitif. Combine all ingredients in a quart sized mason jar or other comparable container. Give it a good shake and stick it in the fridge. After a week or two, strain the mixture, pressing on the apples to extract as much juice as possible. Give it a taste and add sugar if you’d like. Keep in mind it should be pretty tangy. Enjoy about 2 oz of shrub diluted with 6-8 oz of club soda according to your own tastes. Good Morning Kale! We got the mother load of kale in our CSA boxes this week! I’ve covered the basics of massaging kale for a salad here, but this versatile veggie is also a great way to start the day. 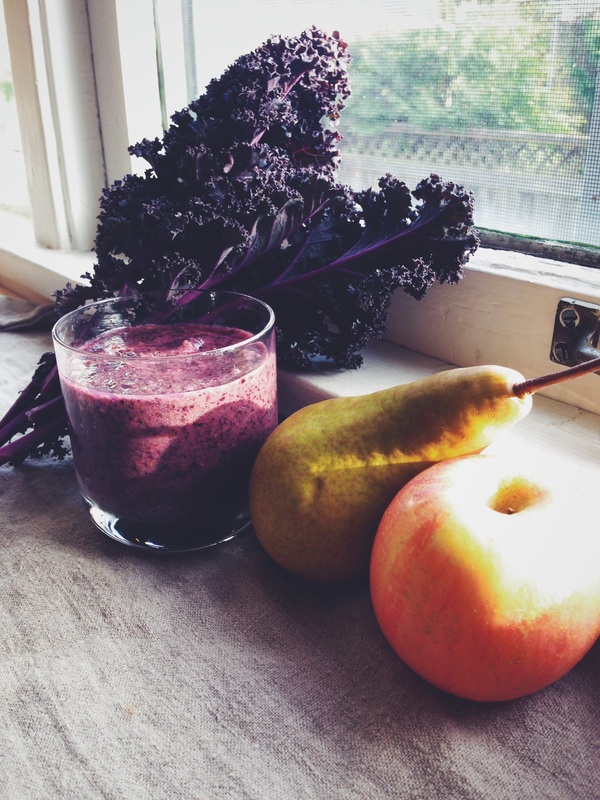 Here’s a simple recipe to jumpstart your morning with a kale smoothie. Feel free to switch things up depending on what you have available- I fashioned mine around the CSA box and the last bits of frozen fruit lurking in the freezer from last year’s harvests. 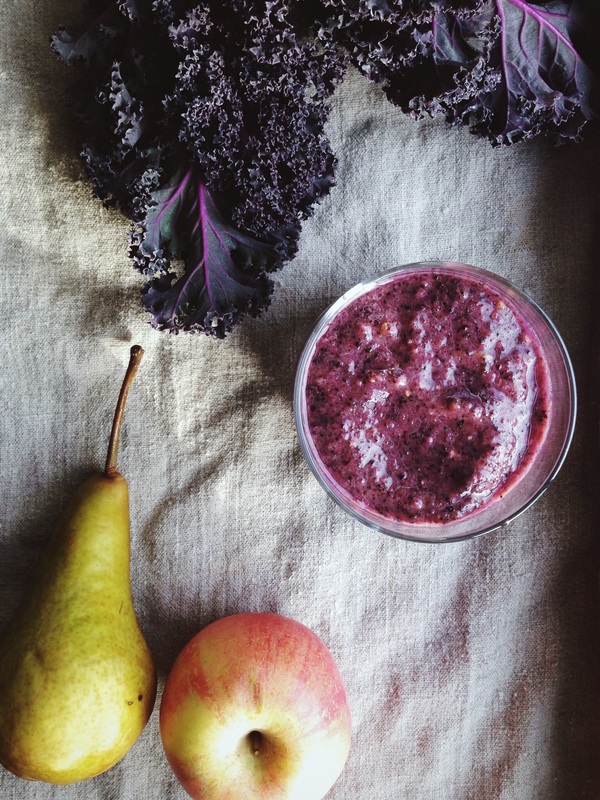 Place everything in the blender and puree until smooth! This recipe makes enough for two!